Product prices and availability are accurate as of 2019-02-20 20:47:23 EST and are subject to change. Any price and availability information displayed on http://www.amazon.com/ at the time of purchase will apply to the purchase of this product. SolarPondAeration.com is offering the best cheap deals for BatteryMINDer 12 Volt Solar Charger-Controller with Desulfator - Model# SCC180. Don't pass it by - buy the BatteryMINDer 12 Volt Solar Charger-Controller with Desulfator - Model# SCC180 online now! Free 2 day shipping is available! No need to look anywhere else. 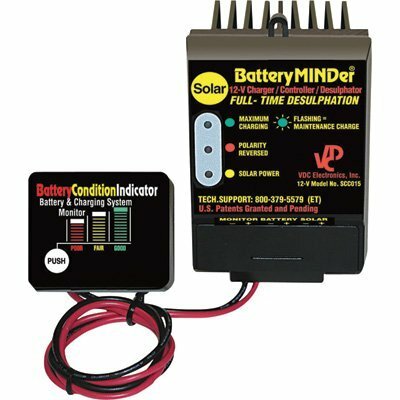 SolarPondAeration.com has the best cheap deals for BatteryMINDer 12 Volt Solar Charger-Controller with Desulfator - Model# SCC180. The 12 Volt, 16 Amp BatteryMINDer SCC-180 actively monitors your battery's voltage and temperature any time the sun is up. The internal program adjusts its output several times a second based on these readings to quickly and correctly charge your battery. When used as a maintainer, the BatteryMINDer is guaranteed to maximize your battery's life and storage capacity. The temperature compensated long-term float maintenance stage can add years of service. Patented high-frequency pulse desulfation is designed to reverse and eliminate battery sulfation, the #1 cause of early battery failure. 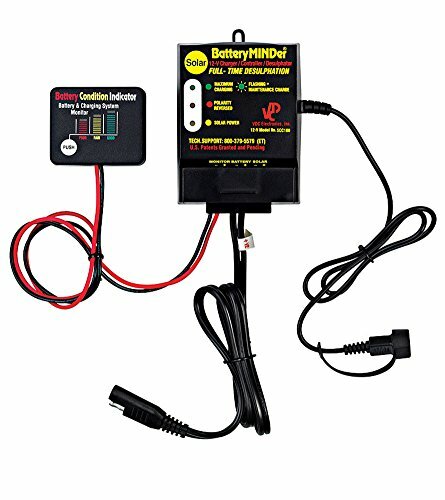 Works with All sizes, types and brands of 12V lead-acid batteries Including but not limited to flooded filler cap / maintenance-free / VRLA / SLA, gel, AGM Optima / Odyssey / etc., starter, deep cycle and hybrid. For Solar Panels up to 200 Watts & Voltages NOT TO EXCEED 25 VOLTS. IMPORTANT INFORMATION ON USING PRODUCT OUTDOORS: Weather-tight enclosure. Always mount units in vertical position with cord sets exiting downward to ensure weather tight integrity. Unit must be mounted this way to ensure long term trouble-free life including weatherproof integrity. Mounting in any other manner or using unmounted (parallel to ground) except indoors may cause unit to fail due to water intrusion that is unable to drain correctly to avoid damage. Included Accessories: 2' Ring Mounted Temperature Sensor and 6' Extension Cable, 2' Fused Ring Terminal Cord Set with Quick Connector, Battery Condition Indicator. 12V, 16A, Up to 180W of Solar Panels Designed for 12 Volt Systems (Not Included) Works with All Sizes, Types and Brands of 12 Volt Lead-Acid Batteries.